How many electronic devices do you own? Statistics suggest that by 2021, each person will have an average of four connected devices – smartphones, tablets, smart watches, wearable tech, laptops, etc. Chances are that you don’t really need or use all of the electronics you have. Chances are that you’d like to replace a perfectly functional gadget with something newer and more exciting. In such instances, the decision to sell used electronics makes a lot of sense. Somebody else will be given a chance to enjoy the respective gadget while you’ll receive some return on the investment in the device. You can easily sell used electronics online if you’re consistent in your efforts and you identify the right channels. The following guide will pinpoint some of the best opportunities for selling used electronics quickly and efficiently. Click here for a lot more ideas on how to make extra cash! Making cash without leaving the comfort of your home can be far easier than you think. Let’s start with one of the classics in terms of getting rid of old gadgets and receiving some cash during the process – eBay. eBay has its official guide and resources for people who’d like to sell electronics online. The good thing is that listing fees do not apply and you can have as many offers up as you wish to. The shopping portal is a great choice if you’d like to sell used smartphones, laptops, tablets, audio and video equipment, cameras, home automation gadgets, drones and wearable tech. Creating an eBay listing is simple, even if you’re going through the process for the very first time. There are several key benefits linked to the decision to sell electronics on eBay. For a start, the platform has a massive, well-established audience. According to the official eBay presentation, there are currently over 168 million buyers. You can decide whether you’d like to sell at a fixed price or offer an item at an auction. The condition of the gadget and the number of such devices currently available for sale on eBay will help you determine which option is better. eBay enables multiple payment methods. If you don’t feel like dealing with international shipping, you can have items listed locally. In essence, eBay offers a lot of flexibility, which is why you should have your old electronics listed there. To become a successful seller, however, you’ll need to follow a couple of key steps. The first one is to provide an accurate description of the item. If there’s a specific malfunction or defect, you should include that information in the description. Having multiple item photos included in the listing is also a prerequisite for establishing yourself as a reliable and trustworthy seller. You can sell almost anything on eBay – people have been known to make money from their old cars, old property and even old furniture. The key is to set an adequate price, to check out the competition and offer the potential buyer something extra in order to differentiate your offer. Looking for more ways to sell things online? Check out these 12 easy apps you can use to sell your stuff! Amazon has a cool Trade-In Program you may want to check out. This isn’t a chance to sell your old electronics per se. Still, you will be monetizing them. Through the program, you will get a gift card if you return an old Kindle ebook reader, a cell phone, tablet, Bluetooth speaker or a video game. According to the official Amazon presentation, the program currently includes thousands of eligible items. If your item is approved for inclusion in the program, you will get paid for it. Depending on the type of item and its condition, you’ll be provided with credit that you can use to buy anything on the Amazon website. The trade-in program is a good choice for qualifying old electronics that you simply can’t sell via another channel. Getting started with the trade-in program is simple. Click here to learn about Amazon Trade-In qualifying electronics and the amount you could get for your old gadgets. Decluttr is another great site to test out if you want to sell used electronics for cash. The marketplace is dedicated to the buying and the selling of used electronics. There are no limitations in terms of the technology type, the age or the condition of the gadget that you would like to list. Decluttr is a great choice because items are organized and can be filtered out on the basis of their condition – good, poor or faulty. There’s also a Decluttr mobile app for added convenience. It is tailored to the need of both buyers and sellers. Decluttr comes with a five-dollar minimum per order. Thus, the items you are selling should cost five dollars or more in order to be added to the website’s catalog. If you decide to sell via the website, you’ll benefit from multiple payment options. Decluttr accepts PayPal, check or direct deposit payments. Currently, you can sell smartphones, computers and laptops, game consoles, iPods, ebook readers, tablets, wearable tech and audio equipment on Decluttr. Once you upload an item, you will get an instant Decluttr valuation. If you set a certain price and the item isn’t in the condition you believe would warrant the respective number, you will be provided with a revised offer. It’s up to you to decide if you want to take it. Decluttr has a great promise to sellers – get the first price that’s offered or the items will be sent back to you for free. In addition, the official presentation states there are over five million buyers on Decluttr. Such a large pool of potential customers increases the odds of turning your old electronics in some cash. The Next Worth program is another nice opportunity you should explore if you want to sell used electronics quickly and efficiently. You have to visit the website and fill out a form about your electronic device. The aim of the questionnaire is to assess the condition of the item you have available for sale. Based on this information, you will receive a Next Worth cash offer for the respective item. If you accept the initial offer, you will be provided with a prepaid shipping label for the respective item. Once the device is received at the Next Worth address, its condition will be verified. If there’s a discrepancy between the condition of the device and the information you provided via the questionnaire, the offer will be revised. It’s up to you to decide whether the offer is adequate and you’re going to benefit from it or if you’d like to have the electronic gadget shipped back to you. Those who decide to accept the offer will have the payment sent to them in the aftermath of the inspection at the Next Worth headquarters. Sellers can choose between two payment options – check and PayPal. Programs like Next Worth’s are a good choice for the people who don’t want to handle the electronic gadget sale on their own. There are several benefits you’ll enjoy if you opt for the Next Worth offer. The company has been around for more than eight years. It is reputable and the electronic device buying mechanism is well-established. Next Worth buys most types of used electronic devices – smartphones, iPods, laptops, tablets, game consoles, wearable tech, audio equipment, cameras and action cameras to name a few. Free shipping and insurance are included for every single item that Next Worth provides an offer on. The only shortcoming to keep in mind is that the offer you’ll receive for Next Worth isn’t necessarily the best one. Multiple reviews suggest that potential sellers have been disappointed with how little they were offered for electronic gadgets. Thus, trying to sell on your own should be the first choice. This is especially true for newer and popular electronic devices. If there’s significant demand for such items, chances are that they’ll generate some interest on eBay. Items that aren’t in high demand but that you’d still like to monetize could be included in the Next Worth program or one of its alternatives like Gazelle. Glyde is yet another website you can rely on if you want to sell used electronics online. The principle here, however, is somewhat different from what Gazelle, Next Worth and Amazon Trade-In have to offer. When selling electronics on Glyde, you have to choose a custom price for it. You don’t get cash for the item immediately, you have to wait for someone to make a purchase. There are certain items that will be included in the Guaranteed Sale program. More information about the terms and conditions can be found on the Glyde website. When items are marked as Guaranteed Sale, the owner is promised that they will receive a specified amount when the gadget is sent in. In this case, the seller will receive the guaranteed amount without having to wait for someone to buy the item. This program is typically available in the case of popular used electronics that are in high demand. Just like in the case of Next Worth, Glyde will send a prepaid shipping label and a container to the owner of the electronic device. Glyde will be sending the tracking information and also making sure that the item is delivered to the buyer quickly and safely. One of the biggest advantages of Glyde is that different categories of electronics are provided with different labels in terms of the item’s condition. Thus, you can be incredibly specific when creating the offer. A potential buyer will know exactly what they’re getting, which increases the odds of finalizing the deal. Keep in mind that Glyde does apply transaction and mailing fees. These are the charges you should be keeping in mind when determining the price range for your device. Once a sale takes place, money will be deposited into the seller’s Glyde account. This sum can be withdrawn to a bank account, cashed out in the form of a check or it can be converted to Bitcoins. Currently, Glyde accepts most kinds of electronics. You can sell tablets, smartphones, laptops, game consoles, video games, wearable tech and accessories through the platform. Everybody wants to make some extra money and selling used electronics online is one of the simplest and most effective opportunities. As you’ve already seen, there are multiple opportunities to try. Selling yourself should always be the first choice because you have a lot of flexibility in terms of requesting a suitable price. Selling on your own, however, will necessitate some hard work. First, you’ll have to make sure that the electronic device is in the best possible condition. Making sure that you have multiple quality pictures of the item will also be a prerequisite for luring potential buyers into getting in touch with you. To sell on your own, you will have to craft detailed and compelling product descriptions that answer all of the important questions about the item and its condition. Selling on your own also means you should be responsive and focused on thorough communication. The second possibility is websites that buy your devices and offer a cash amount for them. If you opt for this opportunity, check out at least a couple of these websites. Getting multiple offers will give you a chance to identify and accept the best price. There could be significant differences between the offers you receive from several websites. You are not obliged to accept the offer you receive. Thus, you will have nothing to lose if you submit your products for assessment via different portals and accept the best offer in the end. The final option is a buy-back program like the one that Amazon offers. Target has a similar buy-back program in which your gadgets will be examined and appraised. Depending on the age and the condition of the electronic device, you will receive a certain amount in the form of a Target gift card. Buy-back programs are a good choice for items that cannot be sold in another way. Also, you should look for a shop or an ecommerce website that you could potentially buy items from. People who are in need of some quick cash should definitely consider one of the above-mentioned options to sell electronic devices. You can sell multiple items, including a smartphone you may be using right now. There are possibilities for getting free of charge devices. Click here to learn more about Simply CellPhones Online and your chance to qualify for a free of charge phone. 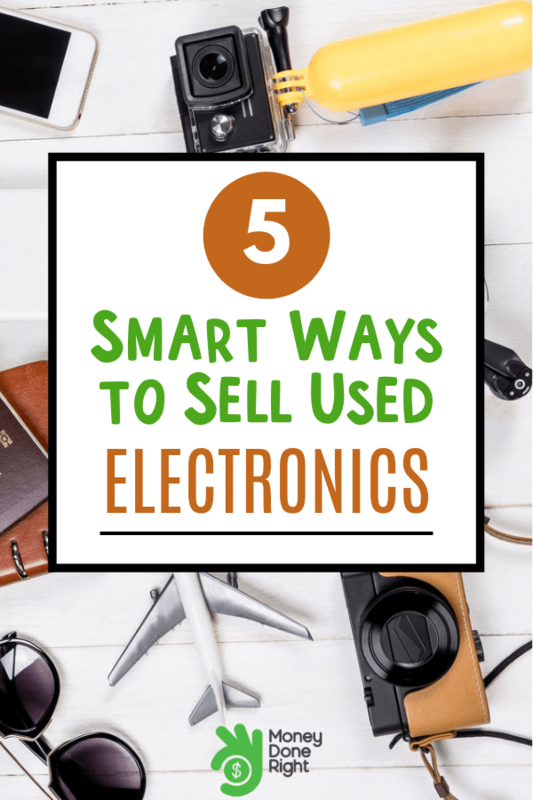 A general rule of thumb is to sell used electronics while they’re still relatively new. This way, you can receive more for your item. New technologies evolve pretty fast. Thus, a smartphone that’s considered popular today will become outdated and obsolete in a few years. If you wait too long, chances are that you will be getting an insignificant amount for the electronic gadget you want to sell (unless it is a limited edition item or it’s a product of interest to collectors). Functioning used electronics can be turned into cash quickly and efficiently. Don’t hesitate to explore the venues mentioned above or alternatives like the Facebook Marketplace and Craigslist. You never know which platform could yield the best possible outcome. Get in the habit of publishing your offers simultaneously on various platforms, including local marketplaces. Sticking to local platform eliminates the need for having to handle shipping. If you’re a relatively inexperienced used electronics seller, this choice could be the best one for you. A final word of advice is to check the electronic gadget one final time before having it shipped to a buyer. Wipe smartphones, tablets and laptops clean. Give the screen a good scrub to remove dust and smudges. If you have the original box or case, send that to the buyer, as well. Being a good seller is all about making a great first impression and the details matter. Something as minor as a dirty screen could impact the review you’re going to receive from the buyer and your chance to continue selling your old electronics for cash. Click here for a comprehensive guide to the best 12 apps you can use to sell stuff online! Do you have some experience with selling electronics? Which venue has proven to be best? How do you put the cash you get for your electronic gadgets to good use? Don’t hesitate to share your experience in the comments below.